OK, so the two are in no way related, but that’s sort of how it goes, Once it’s down to the little bits, one works on what comes to hand or needs doing next. 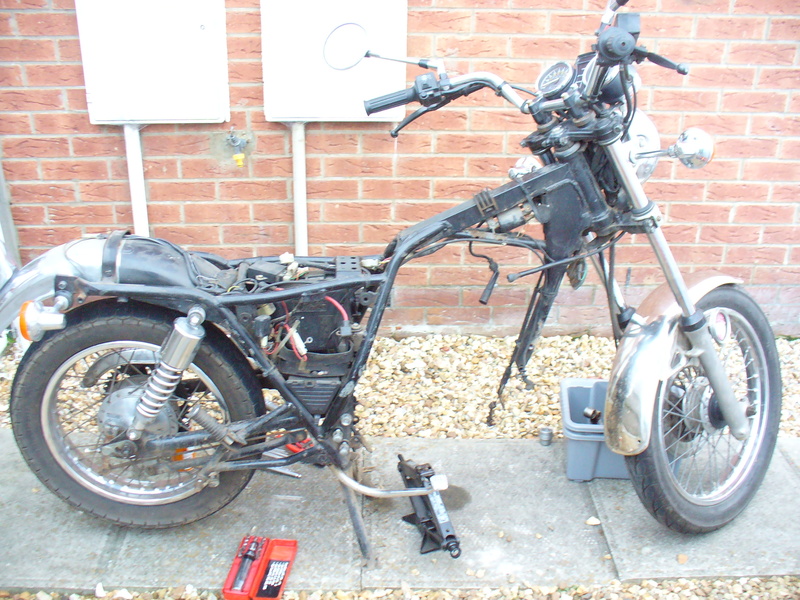 Once the engine was reunited with the frame there was the small matter of hooking up the gear linkage. It didn’t fit. Not only did it not fit, but it showed no signs of ever intending to fit. Just about everything was in the way. Firstly the gearbox selector shaft was about an inch inboard of the frame member between it and the pedal and the Aprilia lever was straight. That one was solved by turning the original lever through 90 degrees (so that it pointed downover) sawing the end off and drilling a hole to take the ball end. Then I had to grind away about half the actuator plate for the side stand switch, to get a straight(ish) run from pedal to lever. 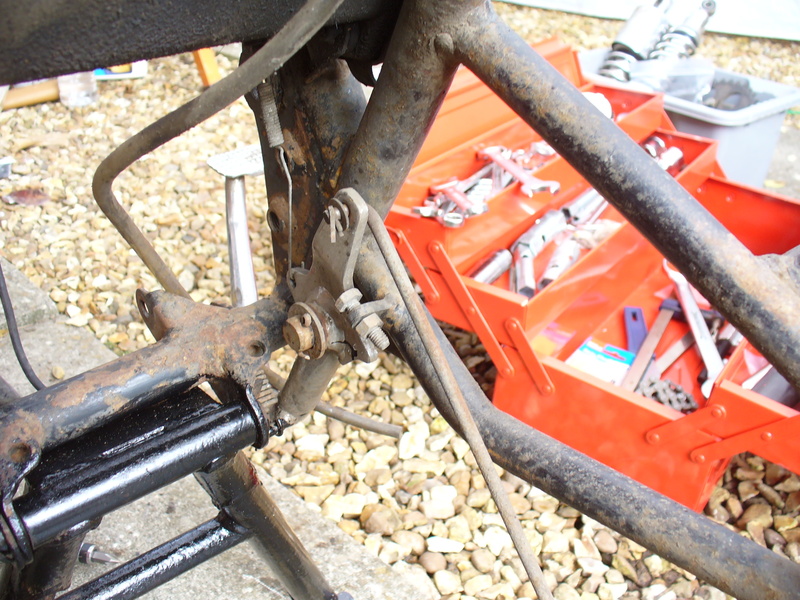 That looked OK and, as luck would have it, the original linkage was the right length. Once that was in place it was obvious that the up and down movement of it when changing gear hit everything remaining. 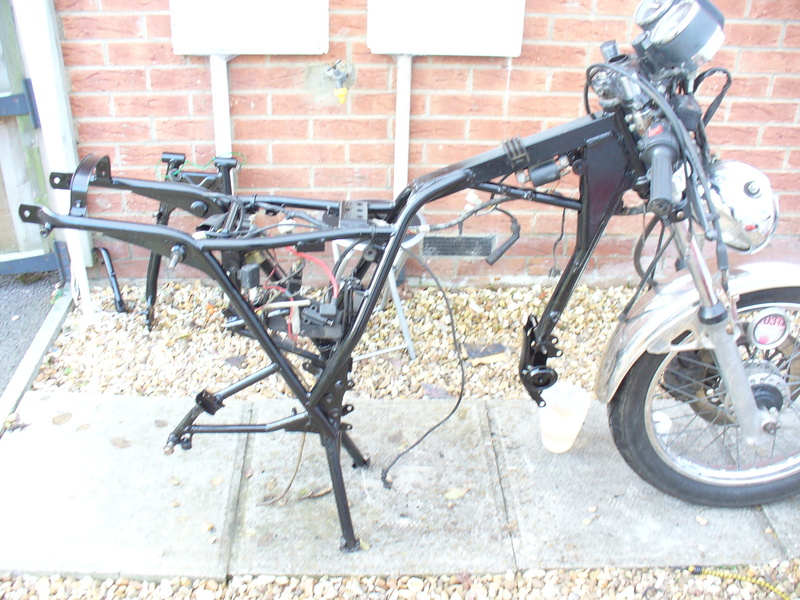 In the end the only answer was to remove the side stand switch and its mounting bracket and to slightly crank the linkage. By this time it was pretty much down to cleaning things up and sticking it all back together. The original rear light and bracket are admirably visible, but about as huge and ugly as only a 1980s designer could produce, so an alternative had to be found. A little LED light from China cost about a fiver and a convenient lump of ally was fashioned into a bracket to hold it and the number plate. The contrast between the two is quite dramatic. This entry was posted in Uncategorized on May 29, 2014 by thebackyardbuilder. The leathercloth on the was well and truly past it’s best, so I thought it would be nice to continue the colour scheme through the seat. 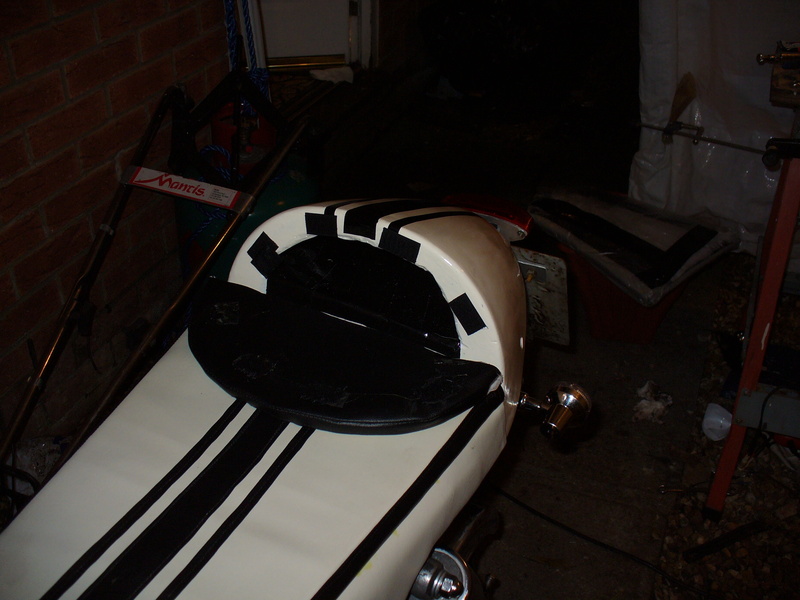 I’ve been through three iterations of designing a custom seat for my ST1100 (I’ve got short legs and a high wide bike becomes an issue) so working in Vinyl is no problem. The first thing you need is the right sewing machine. You can just about get away with a large domestic one, but the little 12V one I had definitely couldn’t cope. A bit of research revealed that there are two types of machine that will do a good job on it. You can get a second hand heavy duty commercial machine for about £1500 to £2000 or any hand cranked Singer built between about 1890 and 1940. I got mine ( a 1930 Model 28 Singer) from the inevitable source for tenner. It ran straight from the box, though it took me a bit of time to figure out the right tensioning for everything. New needles for £5 are a wise investment. Using a heavy duty thread is a good idea if you can find it, but it doesn’t need to be the fancy twine that you’d use for leather. My current Pan seat was stitched with Tesco’s heavy duty thread, has done about thirty thousand miles and none of the stitching has given way. Whilst the thread isn’t super critical, the structure of the seam most certainly is. It must be overstitched, like the outside leg seam on your jeans. That means that you stitch a normal seam, turn one side over and then stitch through the whole lot again (the picture makes it clear) that way the pull on the thread (and the holes) is very much in shear and doesn’t pull the seam apart. 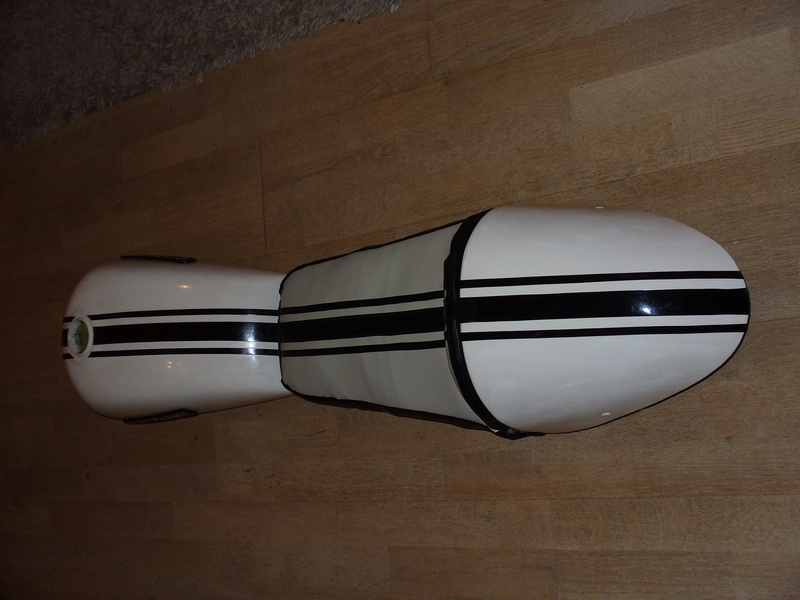 The exception in this case is where I put the black stripes on, but they just sit on top of a single piece of white vinyl, so there’s no structural element to the seams. Incidentally, I can’t feel the stripes, even on the odd occasion when I’ve nipped out in a pair of thin work trousers. The other trick for the seat was to make the pad on the bum stop bit hinged, which gives me access to the hump, where I keep a disc lock and a bit of towel. The flap is just held up with Velcro. The original foam was rather nasty and fell apart when I took the vinyl off, so I replaced that with a Yoga mat from a charity shop (£3). It’s quite firm but, because of the way the riding position works out the riders weight is spread along a fair bit of thigh and I’ve never had any numb bum problems on runs of an hour or less. The off white vinyl had faired quite well through the winter and still scrubs up clean with a bit if effort, which it very seldom gets. I reckoned that the gear linkage would be pretty straightforward (yes, you’d think I’d know better by now) so I started with the brake. b) the brake still works at any suspension position. I must confess to messing around with bits of welding rod, string and whatever else came to hand for some hours before finally coming to my senses and seeing the blindingly bleedin’ obvious. 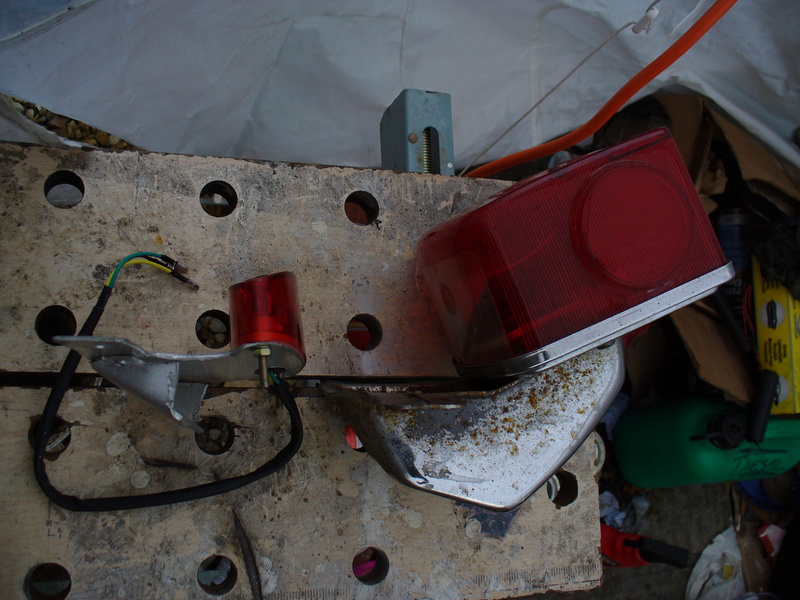 The original linkage worked perfectly and had all the right bits to connect to the brake light switch. Once that penny had dropped it was the work of a few minutes to do a couple of quick sums to get the ratio of levers right. I wanted a rather less movement than on the original lever, but not so little as to reduce my ability to brake hard. On measuring the various bits and pieces at my disposal I opted for a pedal that would require one and a half times the pressure of the original (I’d be in a better position to push on it and I reckoned that the bike was designed for small eastern youths, not European adults) but with only a centimetre or less movement. Once the sums were out of the way I simply chopped off most of the original brake lever and drilled a hole in the remaining stub to accommodate a straight linkage from the pedal. No problemo! The gear linkage would have to wait until I had an engine in the frame, but that would be no problem at all, as the linkage and lever from the Aprillia would fit, honest. This entry was posted in Uncategorized and tagged cafe racer build, GN250 cafe racer, rear brake linkage, rear sets on May 26, 2014 by thebackyardbuilder. The forks will need to be shorter. I see a good few bikes with the forks shortened by slackening off the pinch bolts and sliding the fork legs up in the yolks. Whilst that instinctively feels (and to me, looks) like a bit of a bodge, it has a lot to recommend it. Firstly, it’s quick and easy. More to the point, it’s also quickly and easily reversible. I decided therefore, to do just that as a first pass. That would give me time to assess the handling change, save me having to rebuild the front end in a hurry and I could always come back and shorten them properly afterwards. So it’s time to start on the rest. This is the bit that I usually dislike intensely. 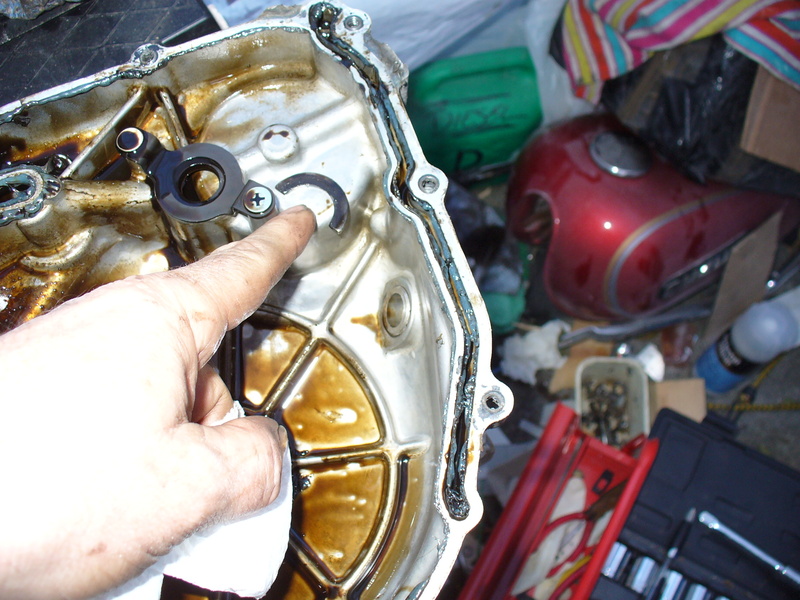 Years of grime, rounded off nuts, bits that are seized up… and that’s just me! To be fair Little Suzi wasn’t too bad at all. There was very little in a particularly poor state. Now, of all the new and clever tools that have been invented over the years there is one which stands out head and shoulders as the most useful aid to rebuilding and restoration. 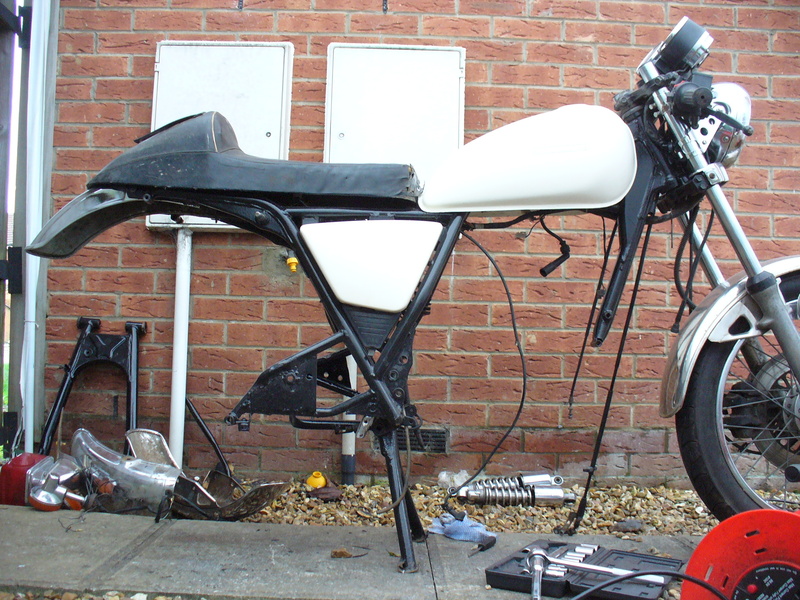 With the engine out and the front footpegs removed, the dog gets to see the proverbial rabbit. 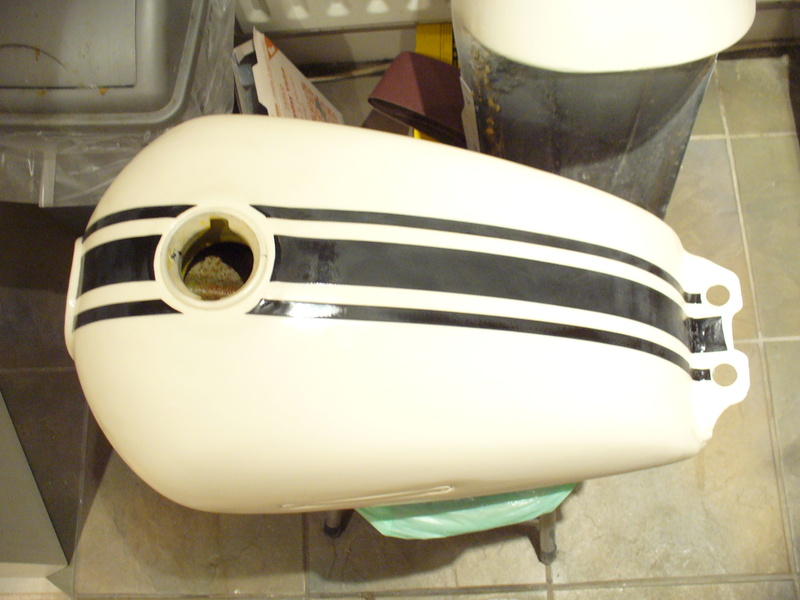 I took the centre stand off early in the proceedings and gave it a clean and some new paint. 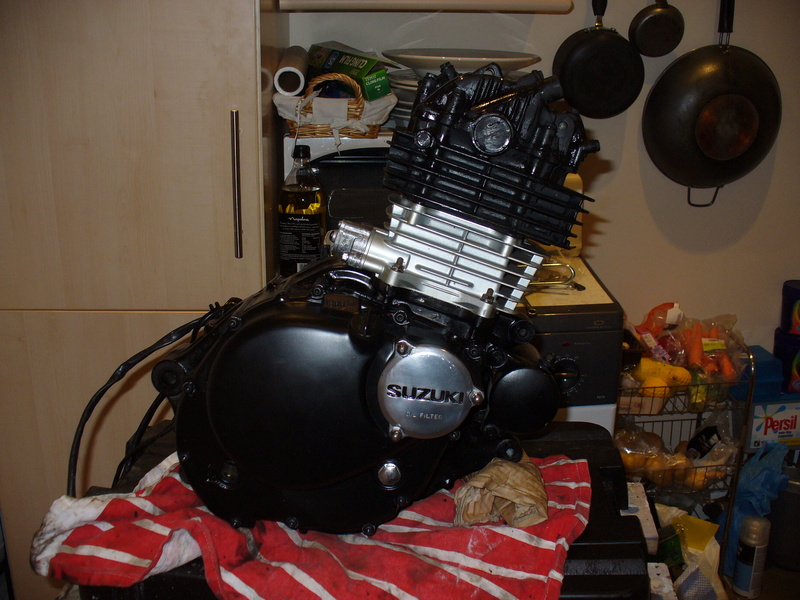 Since the bike was going to be sat on it for most of the rest of the job it saved hassle. 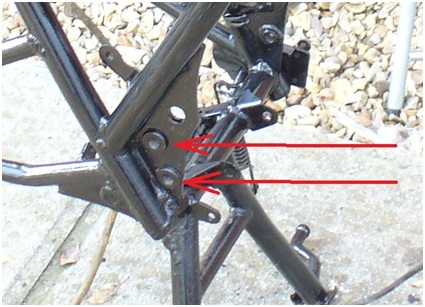 This picture gives a good view of the original brake linkage… and reveals a fair amount of Suzuki standard ferrous oxide finish. But after being sent off for bead blasting and powder coating she was looking much better. NOT A CHANCE!!!! This is just not that sort of restoration. What she got was a good rub down with wet and dry and coat of warm Hammerite smooth, cost roughly £10. On the procurement front, that famous auction site yielded a pair of ex-Bantam clipons for £6 and a set of Aprilia 125 rear sets for £16. 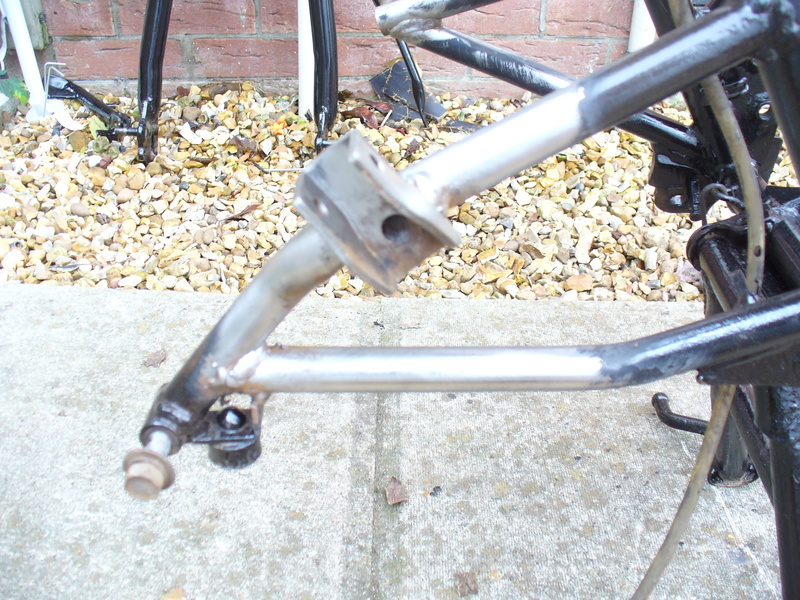 The rearsets were a bit bent and much repaired, having also lived on a Moto-team racer for some time, but they’d do the job. 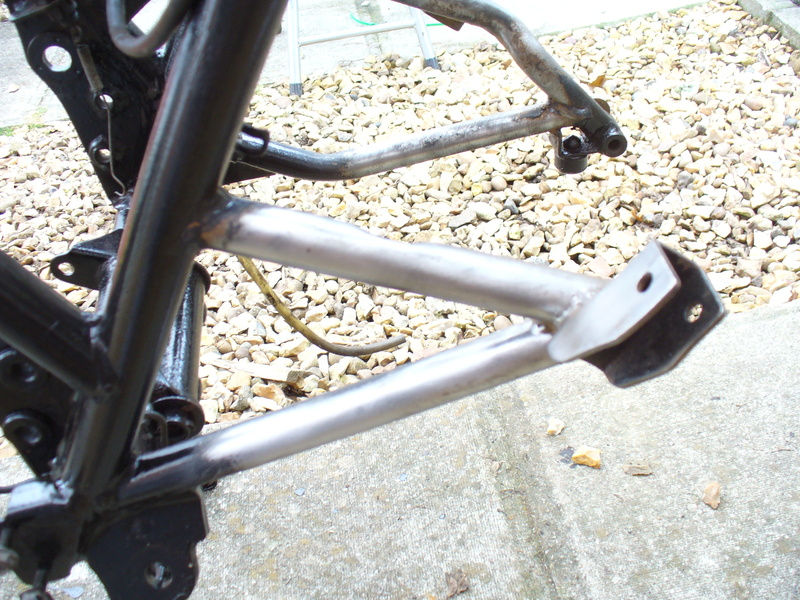 The mounting points for the standard footpegs are set back a little from the level of the frame, see piccy. Fine if you’re going forwards with them, but it doesn’t work if you’re trying to go backwards. Needless to say, the mounting holes don’t line up anyway and whatever goes in there has to leave clearance for the end of the swinging arm spindle. I did come up with a shape for a mounting plate that would do it, but to be really right it would have to be machined and whichever way it’s made there’s still too much cantilever (to clear the frame) for me to feel happy about it. The answer to that problem, and another, came from the “Normous Newark Autojumble”. It was a fine event. We spent pretty much the whole day there and even my girlfriend enjoyed it, which is just as well, since she has entirely adapted her natural shoe and handbag spotting ability to be able to locate motorcycle parts at great distances. I cannot overstate what an invaluable and fulfilling feature in a lady this is. Anyway, two bargains came out of it. One was a rather sad looking bum stop seat for £20 and the other was a battered old Clarke welding set for £25. I learned stick and gas welding as part of my apprenticeship (in electronics!) and then added MIG many years later when I was racing cars, so this looked like a good solution. 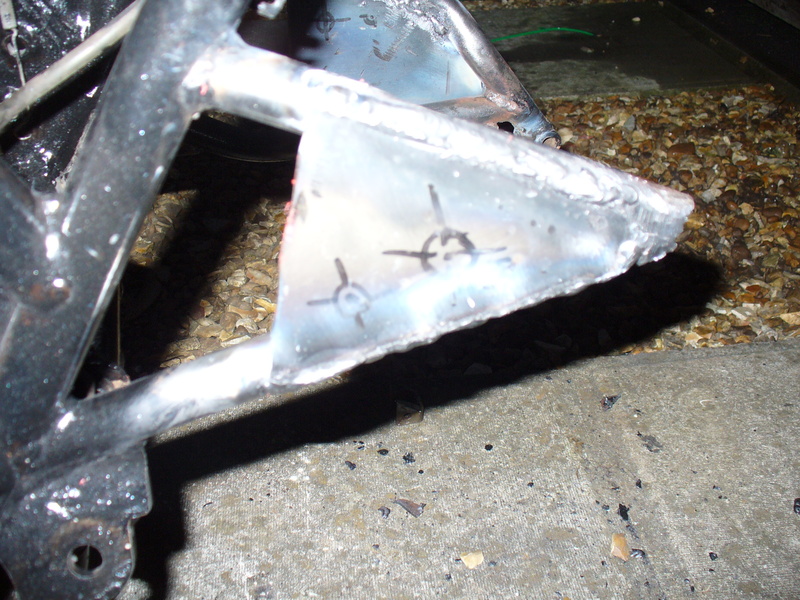 The right place for the footpegs was going to be somewhere within the triangle of frame that supports the rear pegs, so it should be a simple matter to weld a hefty fillet into the gap on which to mount the new ones. 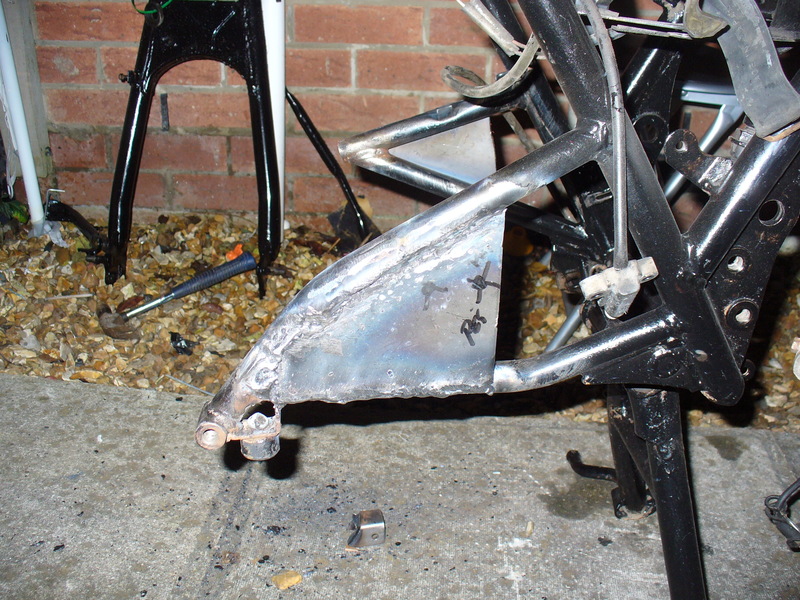 Apart from one tube of one the triangles being slightly cranked, grinding off the rear footpeg mounts and sticking in a couple of bits of plate was as straightforward as it sounds. Positioning the footpegs so that they were in the same place on each side of the bike took a couple of minutes thought, eventually achieved with two bits of string. 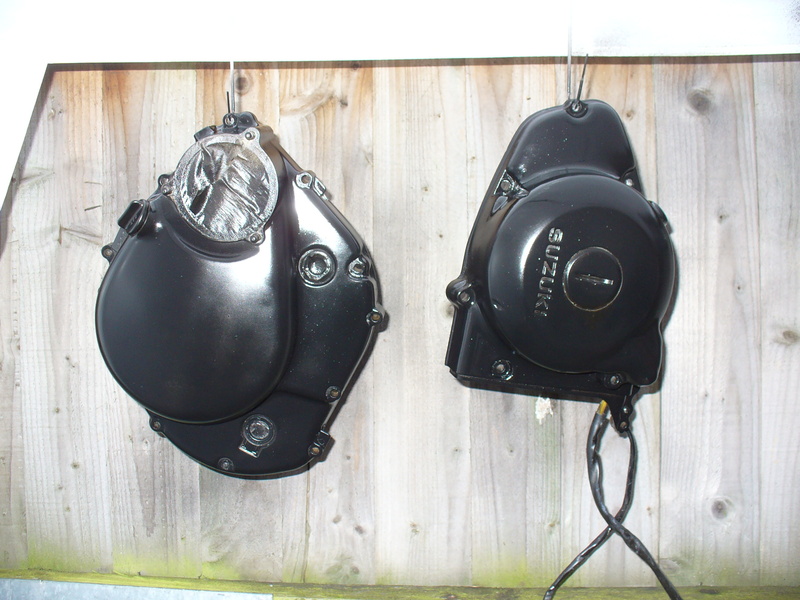 One from the petrol tank mount and one from the rear seat mount. That gave me a triangle, the bottom of which was where the footpeg lives, simples! 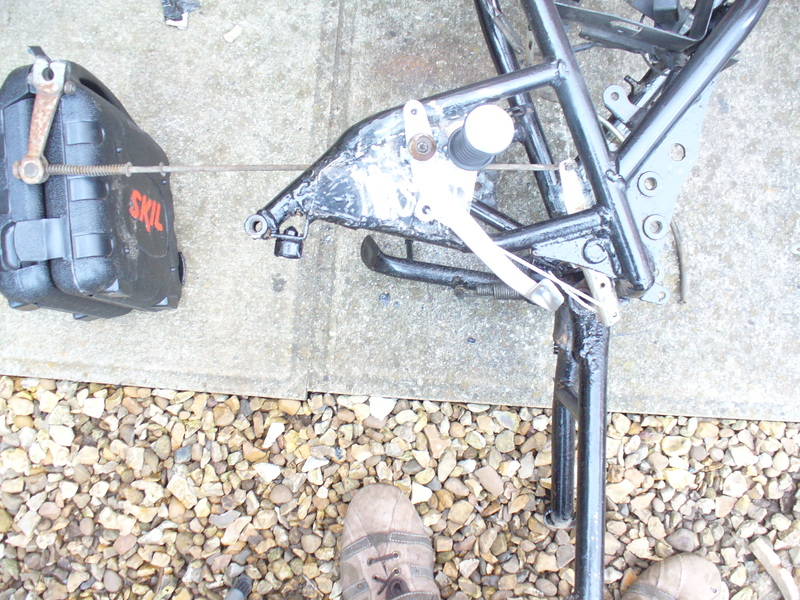 The Aprilia pegs themselves were a bit knackered, so I chose to fit a £5 pair of new rear pegs instead and welded a 10mm nut to the back of the mounting hole, so that I could screw them in with lots of locktight and then fit a locknut behind them. 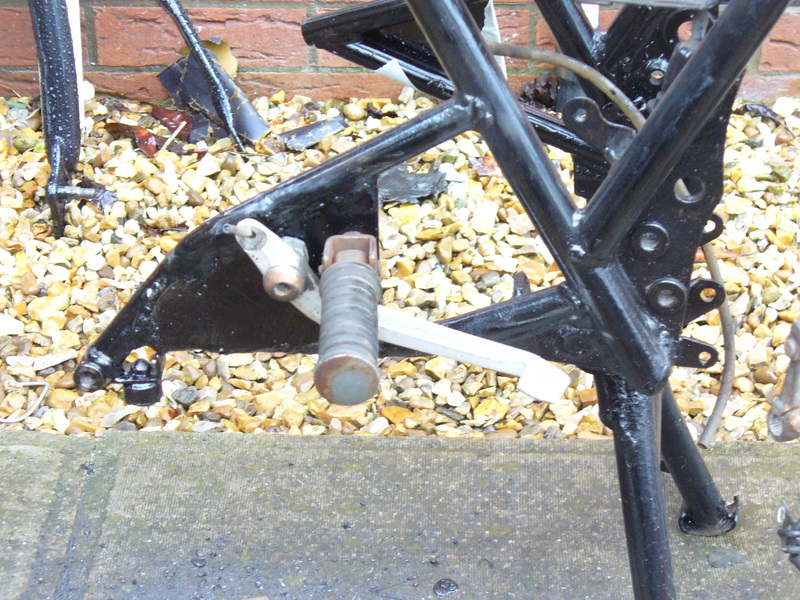 The levers were slightly more complicated, as they needed to stand out from the plate (to clear the linkages) and had plain shoulders on the mounting bolts which used to fit into a “bearing” area on the aluminium mounting. In the end I had to drill out a couple of nuts to provide the “bearing” bit and then weld those and threaded nuts to the mounting plate. It was a little bit of a fart on grinding everything down to just the right height, but once done it all seemed appropriately secure and happy. 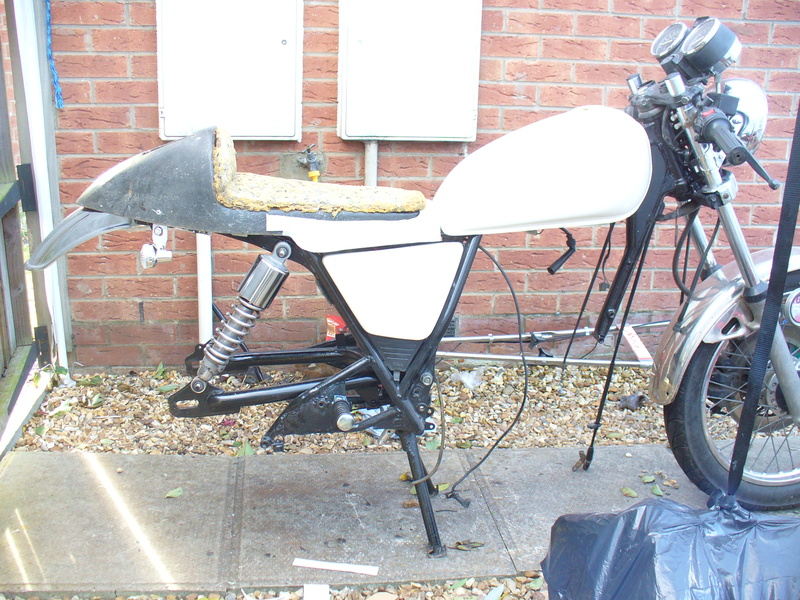 The pictures tell the story better than I can, I used an old footpeg that I found in a box for fitting up. 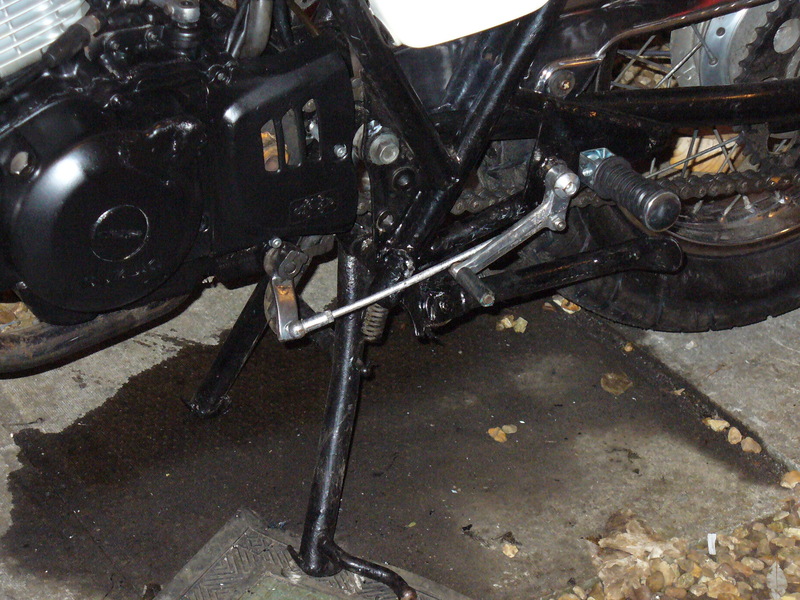 This entry was posted in Uncategorized and tagged foot pegs, frame clean, hammerite, motorcycle frame mods, rearsets on May 26, 2014 by thebackyardbuilder.